Get information on the city of Darjeeling , Hill Stations in Darjeeling, Darjeeling Hill stations, Hill Resorts in Darjeeling, Darjeeling Hill Resorts, Resorts in Darjeeling, Hill stations in India, Darjeeling tourism, Darjeeling Tour Packages, Travel to Darjeeling, Tours of Darjeeling. The mall is one of the most popular places in Darjeeling. It is the center of tourist activities in the town and most of the hotels are clustered around the mall. The mall is also the location of the taxi stands from where tourists can hire taxis to the sites in and around Darjeeling. Many shops including old bookshops and curio stores are a major draw in the mall. The first site to welcome tourists at the mall is the local people offering pony rides and photographers clicking pictures of people as they ride the ponies. People tired from walking can take a break and sit on the many benches placed in the mall and sip the excellent tea sold by local tea vendors. There are many restaurants, cafes, and ice cream parlors around the mall. Early morning and evenings are the best time to stroll in the mall. Ghoom is the last destination of the famous Darjeeling toy train. Located six kilomerters from Darjeeling, Ghoom is home to the famous Ghoom monastery at an altitude of 2407 meters. The main attraction of the monastery is the 4.5 meter statue of Maitreya Buddha. This institute is an interesting tourist spot offering information about mountain climbing and the history of mountaineering in the region. Mountaineering gears are on display here along with rare pictures related to Mt Everest and other important mountain expeditions. The institute was established in1954 after the successful conquest of Mt Everest, and offers training in mountaineering and rock climbing. This beautiful monastery situated on CR Das road was transferred in 1879 from its original location on the observatory hill. The monastery has an interesting library that contains many old Buddhist texts and scrolls. This place is a popular point from where tourists can get a magnificent view of the entire region and Mt Kanchenjunga on a clear, sunny day. There are many other tourist attractions in Darjeeling. These include the famous tiger hill, Dhirdham temple, Lebong race course, and the handicrafts museum. 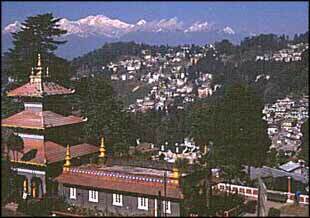 Kalimpong, Takdah, Mirik, Lava, Lolegaon and Sandakphu are some of the important tourist spots near Darjeeling. A tour of Darjeeling offers wonderful opportunities for shopping and many adventure activities. Touristplacesinindia.com offers all inclusive information about Darjeeling and other tourist places in India.